Last week, I took a day off from work, drove a couple of hours, travel more than a hundred miles, just to see a concert. It was not a concert of one of those pop superstars, like Adele or Lady Gaga. Nor was it a concert of some well-known classical artist like Andrea Bocelli or Yoyo Ma. It was my daughter’s concert. It was their university’s orchestra performance. And it was their first concert for this school year. I have seen my daughter play cello in the orchestra multiple times in the past. From her grade school days, to high school days, and to community orchestra. From the screechy-sound of beginners, to more polished tones of intermediate, to quite advanced. Though this maybe the best group that she’s been a member so far. After all they were all music majors, both undergraduate and graduate students. As far as I am concern, they can be considered “professional” musicians now. We knew back then, that when we introduced our little girl to music, that she has a special attachment to it, and we cannot deny the fact that she has a gift for it. So it was no surprise that that was the career path she chose to pursue. Even though honestly, I tried to sway her to a different path. I know as a parent, we wanted a secure future for our kids. So we prefer professions like engineer, or doctor, or lawyer. But what’s wrong with literature, or arts, or music, if that’s where our child’s passion is? Success should not be gauge only on how much money we can earn, but also on the satisfaction and joy on doing what we love to do. It was heartwarming to witness that my daughter is getting very skillful on the cello, as well as playing with the orchestra. But playing cello is not even her major. She’s majoring in another instrument. A much larger instrument, the piano. So there will be more concerts and recitals to attend to. All those years of music lessons are finally paying off. We’re proud as well that our homeschooling “experiment,” (we homeschooled her from kindergarten to high school) was a success. All of our worries that her education was not adequate, were all appeased. Now, my daughter is not merely surviving, but thriving in college. She even was granted a good scholarship that covers her college tuition, so we only have to pay for her food and dorm. With the cost of college education ever on the rise, ranging from $10,000 per year in state universities (for in-state residents) to $50,000 or more per year in private and more expensive institutions, getting a college degree these days can definitely break the bank. Back to the concert. Though some of the selection they played were kind of hypnotic to me, I was able to stay awake through the concert. Over all it was fantastic. After the final bow, the audience were up on their feet. The only gripe I have on the concert is that it was not free. Sorry, I’m cheap. But I get it. It helps support their university’s music program. Besides, the quality of their performance was superb that the concert was even recorded, and maybe aired one of these days on a public radio station. Definitely worth paying for. So for the first time, I bought a ticket just to see my daughter perform. But I’m OK with that. I wonder, would I have to pay a more expensive ticket when it’s time for her solo piano performance? Last summer when we went home to the Philippines, a family gave us ukulele made from Cebu. Not just one, but two. They said one for each of my kids. Though they said I can borrow it too if I want to. It is a known fact that Cebu is the center of guitar manufacturing in the Philippines, boasting that among the best guitars not just nationally, but international as well, were made there. Cebu is known to be one of the finest crafters of ukulele too. Definitely we got two beautiful and good-sounding ukuleles. I don’t know how to play the ukulele, but I believe it is simple enough to learn. I have played another 4-stringed instrument in the past, the violin, and I think ukulele is much easier to play than that. Or so I thought. One of my favorite song that is played with the ukulele is “Somewhere Over the Rainbow” by the late Hawaiian singer Iz Kamakawiwo’ole. I just love his version of that song with the certain “island-feel,” the care-free strumming, and his dreamy rendition. No wonder that is the first song I wanted to learn in the ukulele, in that distinct style. So after we got back from the Philippines last year, I searched on YouTube and watched some tutorials to learn it. First thing to learn is the kind of strumming on this specific song. It is called “island strumming.” But for the life of me, I can’t get it. I guess I am not coordinated enough. My left hand can do the chords with not much hitch, but my right hand just cannot keep up with the right rhythm of the strumming. Easy to learn huh? So I gave up. I did not touch the ukulele again for several months until a few weeks ago. My daughter’s music teacher said that it will be nice to have a number that will be different and special if in my daughter’s recital, I play the ukulele while she plays the cello. What song? “Somewhere Over the Rainbow,” of course! I took on the challenge. Besides my son will also play with us, playing the other ukulele. So he can carry me if in case I mess up, right? So I practiced, and practiced some more. Soon I had my right hand perfecting the “island” strumming. I can transition between chords with ease. I can do it with my eyes closed. I can even do it in my sleep. Maybe not. The day of the performance came. As I was strumming on the ukulele, I tried to imagine that we were in a beautiful tropical island, under the swaying palm trees, with the warm breeze blowing, the waves softly lapping on the beach, and we’re lost in a care-free world somewhere over the rainbow. Off course I got lost in my chords too, but my daughter and son played beautifully that nobody even noticed my slips. 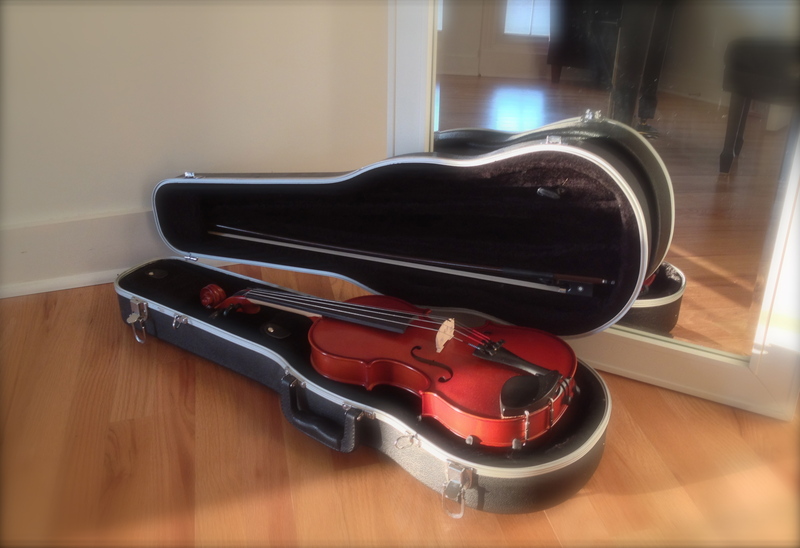 When I came home today, I was greeted by a high-pitched humming music. The sound was loud enough that I felt the whole neighborhood was buzzing. No, it was not an out-of-control orchestra. Nor a marching band that went bonkers. 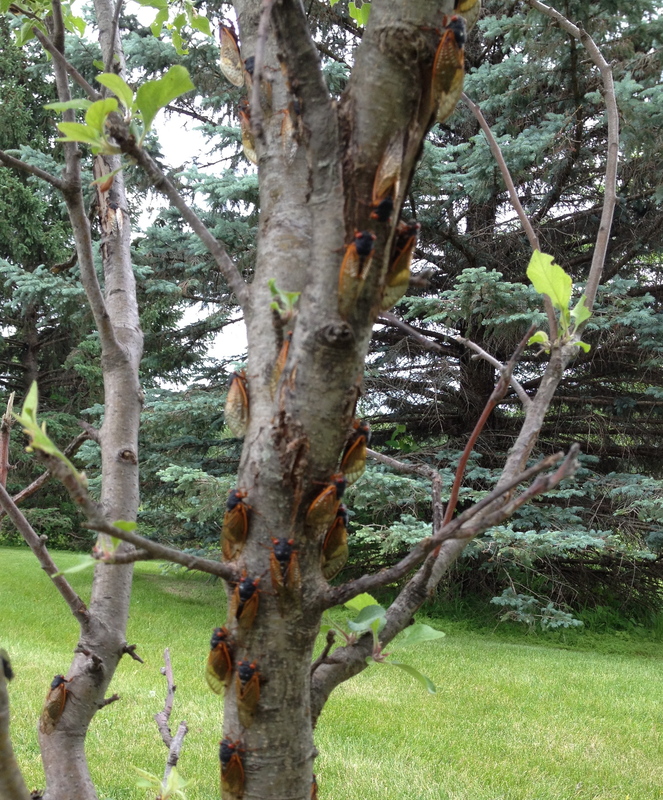 It was a mass choir of cicadas. As I went out in our yard, I really felt the vibrating noise, especially when I walked under the trees. I saw cicadas everywhere. And even on my hand. 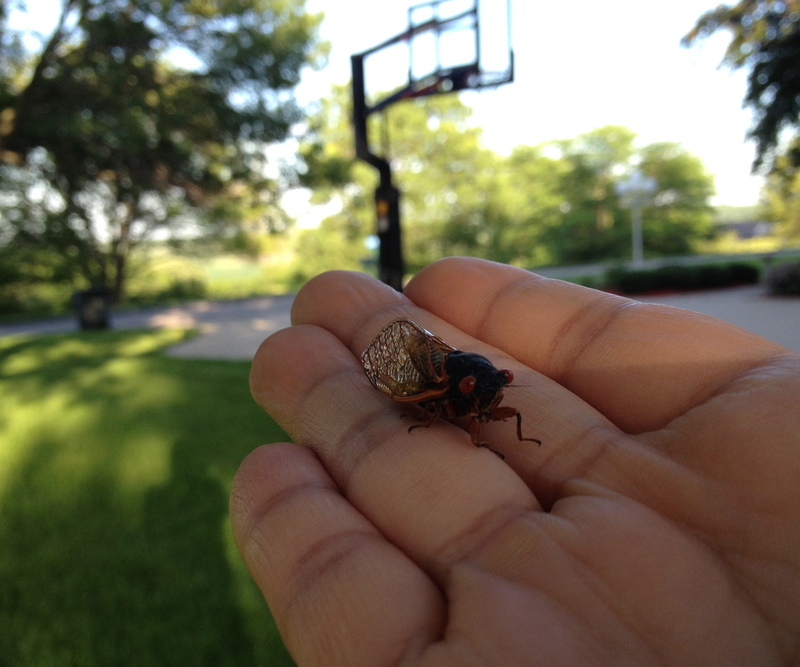 There are many species of cicadas. 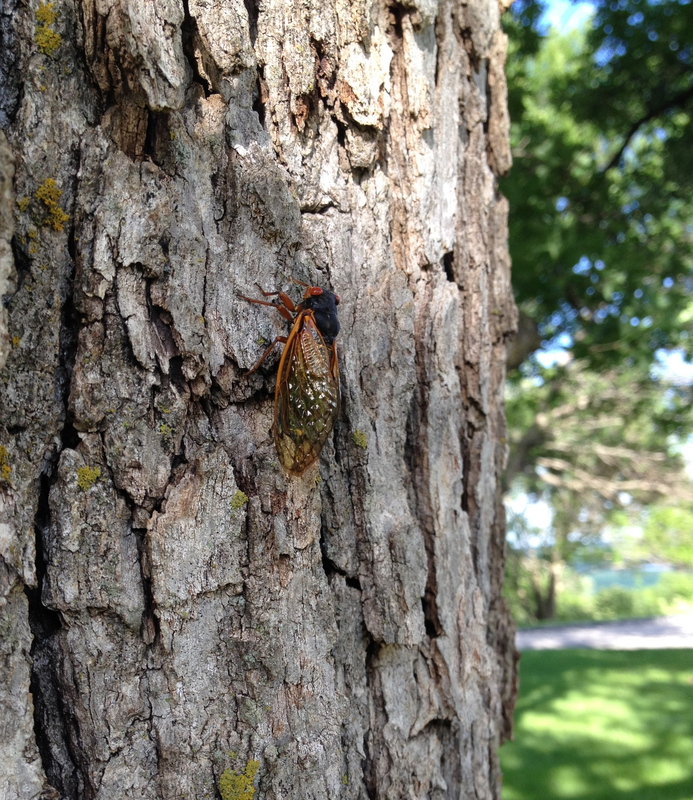 What is appearing this time here in Iowa is the 17-year variety of these noisy insects. That means this certain species had disappeared for a long time. For seventeen years they have vanished out of sight and lived under the ground in hushed darkness. But now they are out. They have emerged. And in swarm. After long years of silence they are singing their song. Happily and loudly. At least it is better than the song I heard recently from the Philippine senate that was part of a privilege speech. Humans sing when we stretch and vibrate our vocal cords. Crickets produce their sound by rubbing their wings. 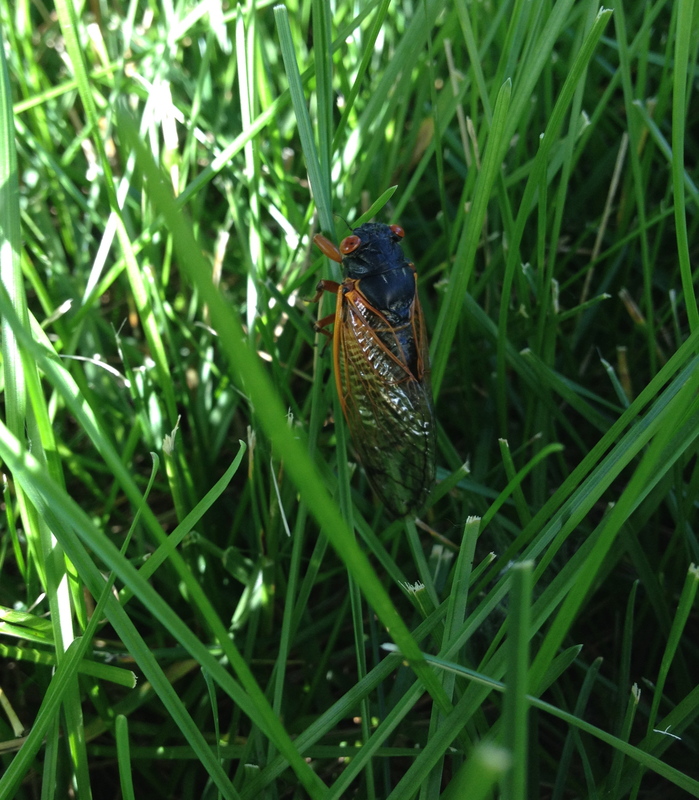 Cicadas on the other hand sing by vibrating two ribbed membrane in their belly, and their hollow abdominal cavity amplifies the sound greatly. Some species can register more than 100 decibel when singing. Come to think of it, my belly also rumbles loudly when I am hungry. And what are these chirpy cicadas singing about? It is actually a love song. They are calling for their mate. Some love songs can make you cry. Some love songs can pierce your ears. With all the throng of merry cicadas singing, I admit the sound can be deafening. But I will enjoy this special concert while it last. For I have to wait another seventeen years to listen to this remarkable event. Here’s a sample of their lively music. ‘Round here, we’re carving out our names, ‘Round here we all look the same, ‘Round here we talk just like lions, but we sacrifice like lambs…..
Those lines were from the song ‘Round Here by the Counting Crows. I first heard it about 20 years ago. It mirrored the circumstances I was in. A time when I just arrived ’round here. A time when I began to carve out my future and my name. But in that pursuit, I left my beloved country and sacrificed almost everything. Music is intertwined in our lives. From the time our ears were open, from the time of our birth, or even when we were still inside the womb, and up to our dying days, we listen to music. Many of the songs we learned to treasure may not be because we love them initially, but maybe because of the situations or events that are associated with them, when we first heard them. For instance, when I listened to songs of Tears for Fears, or Duran Duran, or Spandau Ballet, it brings back memories of my high school and college days. One specific song, a remake of “Crying in the Rain” by Aha, reminds me of that particular day when I was walking across our university’s soccer field. My PE teacher forced me to drop out from his class for a “mistake” that I did not commit. I was close to tears, and of course it was raining. But maybe that’s a separate story I’ll write someday. Then when I listened to Hootie and the Blowfish, or Counting Crows, or the Cranberries, this make me think of the time when I transition from the Philippines to the US. It was also during that time that I listened and learned to like the Eraserheads, a Filipino rock group, as it became my sort of connection to the country that I left behind. I listen to music most of the times. Especially when I am alone. Once a month, I go to an outreach clinic, somewhere outside the city of Des Moines, that is considered rural Iowa. Even though the travel takes me about an hour and half, I really don’t mind the drive at all. The drive is easy with no traffic, passing through serene Iowa landscape of prairies and farm fields. This gives me a time alone to think while I listened to the music of my choosing. Today, I picked Counting Crows as my music for my long drive. One of their songs, Omaha, goes like this, “Omaha, somewhere in the middle of America.” It was interesting that when I first heard that song, I have no idea where Omaha is. But now I know exactly where it is. It is about 2 hours away where I am driving to. My car is traveling at 70 miles per hour. My thoughts at 100 miles/hour. The rain is pouring while my wipers beat in rhythm as the Counting Crows sings, “I am the rain king…” While the memories are also pouring.